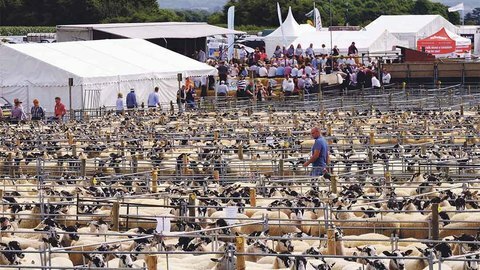 ALMOST 24,000 sheep were sold over two days at the Thame Summer sheep fair grossing more than £2.7 million. The first day comprising of white-faced sheep, older ewes and lambs peaked at £200/head for a pen of Beltex shearlings from M.F. and D.M. Elkington, Weedon Lois. Bill Rawding, Marsworth, sold black Beltex to £192. The average for this section was £134. According to the auctioneers, Beltex and crosses were a little harder to sell this year with buyers being very selective. Texels sold to £198 from Messrs Lawrence, Market Bosworth and Michael Cross, Blackthorn, sold Texel cross Cheviot mules to £168. Garfield Stephens, Kirby Bellars, won the prize for the best pen of white-faced sheep with Texel cross Cheviots selling at £165. Mules dominated the older ewe section topping at £116 from Messrs Rawding. Suffolk crosses sold to £111 for Rob and Caroline Mole, Chearsley. Messrs Ivory, Gaddesden Row sold Cheviots at £100. Ted Dawson brought 300 ewe lambs from Durham and achieved £95 on four occasions. Most of the store lambs on offer were long keepers with Texel crosses selling to £68 for Gerald Levinge, Staines on Thames. Charollais crosses sold to £65 and Liam Roberts, Ruthin, sold 200 Suffolk crosses to £64. Day two started with almost 8000 Suffolk cross shearlings and second crop ewes with Eddy Bullman, Thornborough, winning the best pen and selling for £165. Trade was consistent to average £124. The 8000 Mules met a more difficult trade for the ‘run dry’ sheep. Henry Tustian, Epwell, took the best run of 60 or more and sold to £176. Richard Haynes, Winslow, won the best pen of dry sheep and topped the section at £178. Messrs Hunt sold a run of 700 which had had lambs to £152. Second crop Mules sold to £137 for Conrad Lester, Brackley, to average £123.50. The show of pedigree Beltex was won by A. and R. Livestock, Eldersfield, with a two-shear ewe which sold for £900. They also won the ram lamb class selling at £850. V.J. and M.L. Roots, Southam, took the male championship with a shearling ram which sold for £720. Shearling ewes sold to £340. Charollais rams sold to £670 for G.A. and J.A. Curtis, Evesham with ram lambs to £440 for Messrs Seahawes, Little Chesterton, who also sold Blue Texel shearling rams to £365. Texel shearling rams sold to £500 for R. and B. Smith, Slapton and R.J. Warnock, Capel. Beltex cross Charollais and Beltex cross Texels both peaked at £600 for Davies Brothers, Llangadog, and P. Elkington, Ashperton, respectively. Suffolk ram lambs topped at £412 for M.J. and J.A. Pinney, Holcot with shearlings to £400 for Thomas Blunt, Milton Keyes. Lleyn shearlings from Drayton Farm Partnership, Petersfield, sold to £280. Auctioneers: Thame Farmers Auction Mart.